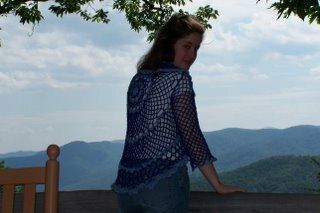 My blog about my knitting, crocheting, and anything else I feel like ranting about! You are looking at the old blog. Wouldn't you rather be looking at the new blog?!? Modifications: Shortened the sleeves, deciphered the pattern! This isn't the best pic of the jacket in the world, but you get the idea. Except for the sleeves and a little bit of tightness in the armholes, I really love how this turned out. 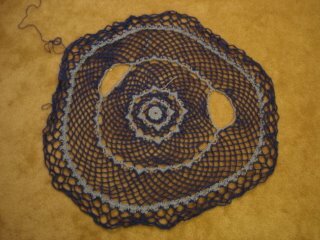 This pattern was absolutely fraught with mistakes which made making this a bit difficult. Luckily they had some very nice pictures in the magazine or I would have gotten absolutely nowhere with this. As I've said before, I'm not sure who is to blame for that, but there you have it. 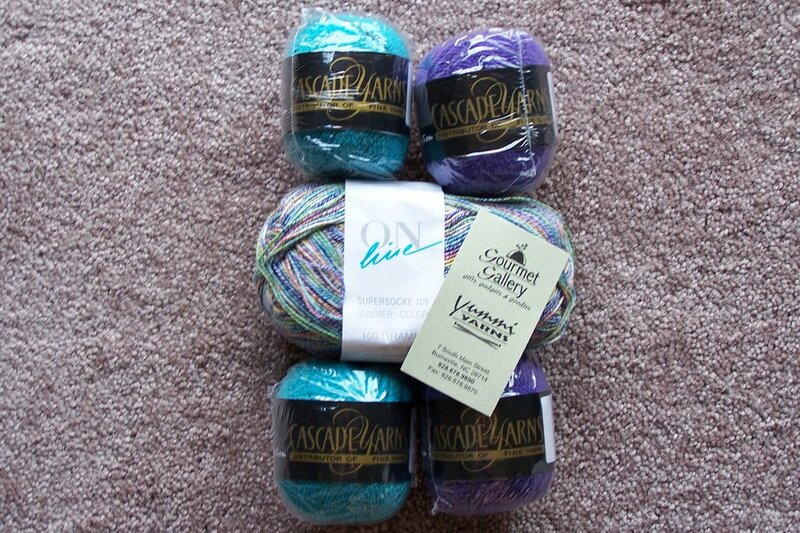 Along with the bad directions I should have expected that the yarn requirements weren't quite right when they gave the same requirements for each size. 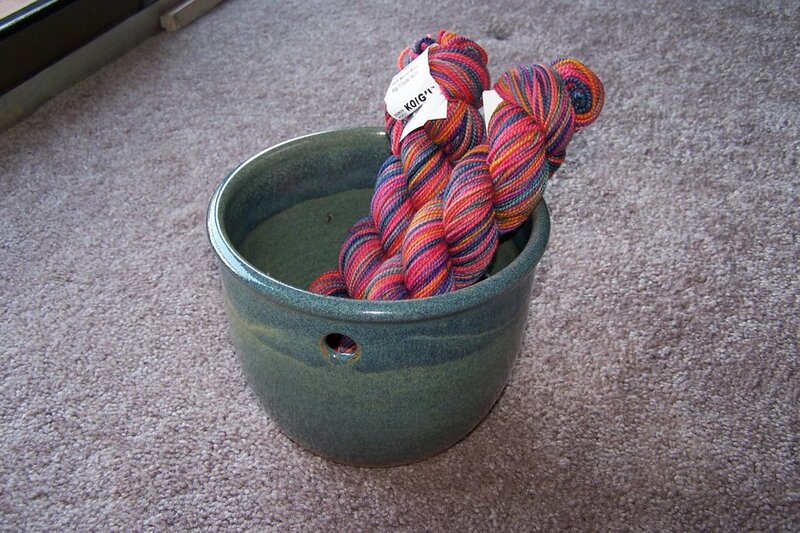 So I did, of course, run out of yarn. I had planned on shortening the sleeves anyway since I plan on wearing this to work and I didn't want to be pushing them back all the time, but I didn't expect them to be *quite* this short. I ended up making the sleeves as long as I could with the darker blue color and then just adding a simple single crochet edging to finish it off. Not as nice as I would have liked, but not a bad solution considering the situation. As I said, the armholes are a little tight, but considering the fact that this is a 50% cotton yarn, I think it may stretch a bit anyway. I'll be very interested to see what happens when this hits the water, since I haven't quite gotten it there yet. I'll be sure to report any interesting findings! My weekend plans involve packing stuff up, cutting stuff off, important acquisitions, a little sleep, a little music, and a big change. Details to follow soon. Have a great weekend! Pattern: Generic Toe-up from Queen Kahuna. Here is pair number three for HWJF. He's holding them up while relaxing on the porch at camp. There were a couple of firsts with this pair of socks for me. This was my first time using Opal yarn and I enjoyed it. It's very springy yet strong and I think it will make a nice wearing sock. Coupled with this is the fact that this was my first time using a size 1 needle for socks. 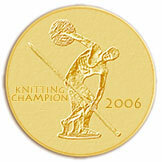 While it did make them seem to take f-o-r-e-v-e-r to knit, I can definitely see the difference in the fabric. These will probably be harder wearing just for the gauge difference, never mind the yarn. In this pic you might be able to tell, if you look *real* closely, that this is this pair of socks stage debut! 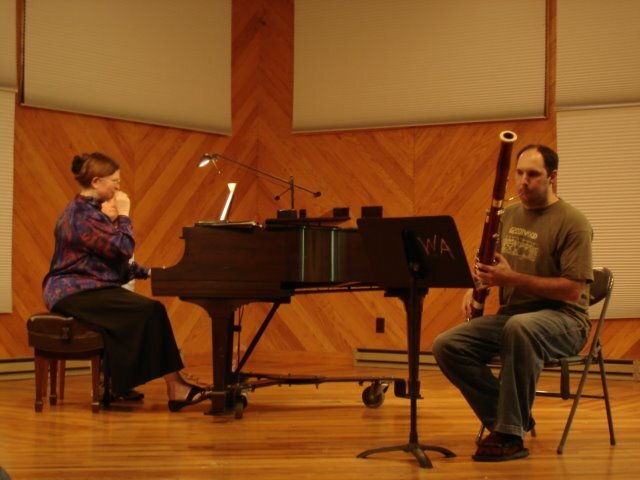 As soon as they came off the needles they went on HWJF's feet and he happened to be playing in recital hour that day. When he got on stage he introduced himself, "Hi! 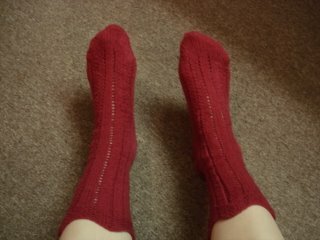 My name is _(HWJF)_ and these are my new red socks!" I almost died. Luckily most everyone had already seen me working on them so they knew what was going on. Although someone asked him later about his new Fox (a popular brand of bassoon, in this instance). 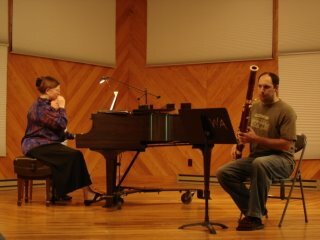 Another bassoon camp is in the books and I am finally back in CT after a short stay in NJ to do laundry and put my stuff away and another short stop in NY to deal with car issues. 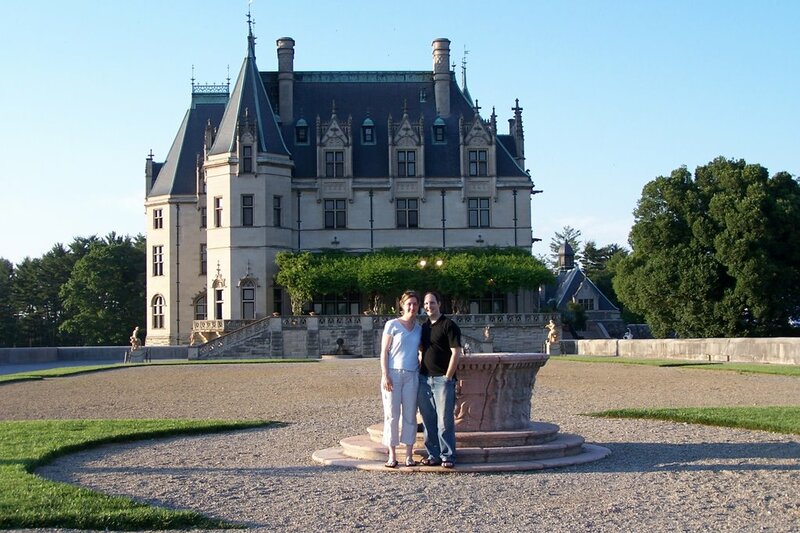 If you aren't into reading about people's vacations, you can skip this post now. I started out my vacation by taking Simba to stay with her grandparents in NY. She is not a happy kitty when it comes to car rides, but we managed to make it without much incident and very little crying. 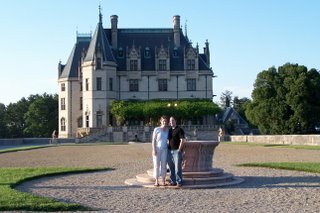 I couldn't stay long because I had to be in NJ that night to load the car since we were leaving for camp the next day. I made my first trip to NJ without a problem other than thinking there was going to be a rest area and gas on I-287 when there was none. Luckily I managed to make it to my exit and there was a gas station shortly thereafter. The funniest part of that trip was the fact that I needed directions to my own apartment! I still haven't quite got things in NJ figured out, but I'm getting there. After HWJF got out of work we packed a few things in the car, got dinner, and then tried to prepare for the arrival of Gail Warnaar who would be staying with us that night. 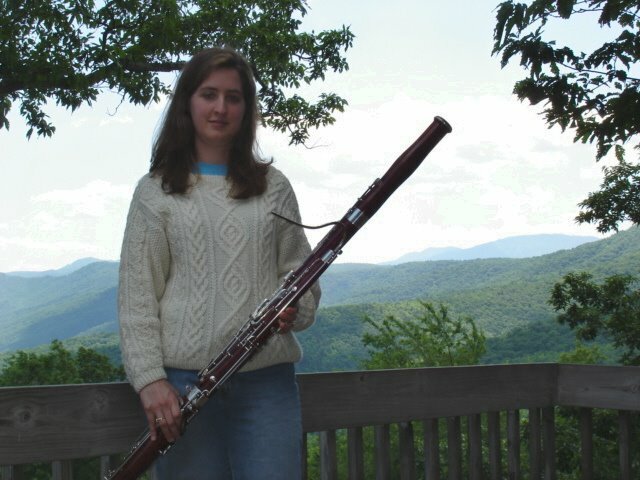 She runs a B&B in Vermont and also a sheet music shop specializing in double reeds which she transports to camp every year. Her drive was significantly longer then ours, so we offered her a place to stay in exchange for staying with her daughter the following night. Sunday morning we finished packing, got our usual weekend Panera breakfast and it was off to camp! 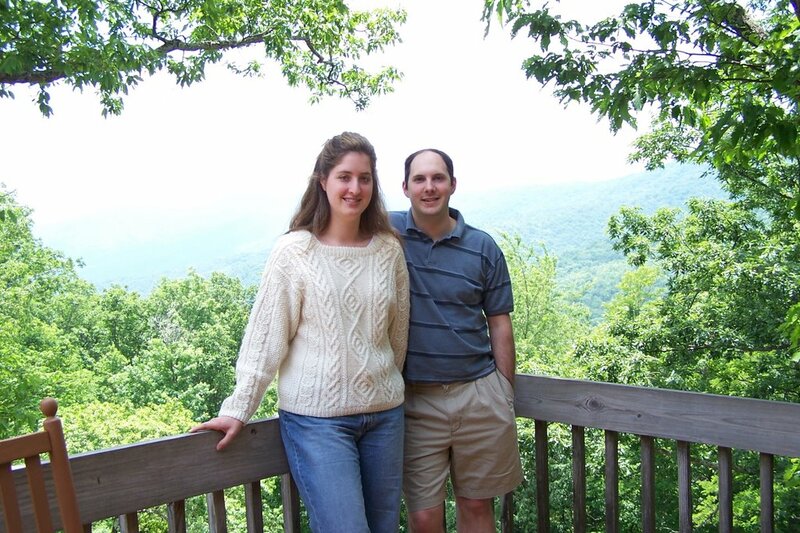 We drove to Gail's daughter's house in Harrisonburg, VA which only turned out to be a 5 hour drive from NJ. It was a pretty easy day and HWJF drove the whole time so I actually got to knit the whole time! We had a very nice evening in VA and we left Monday morning to finish off the trip, about another 7 hours. We arrived at camp around 3pm to find rather hot and muggy weather with very little breeze. 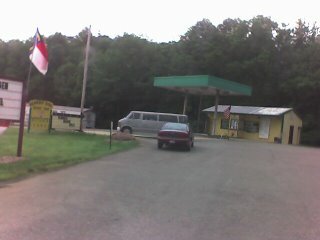 Something quite unusual for Little Switzerland, NC. By the time we unloaded our own stuff and then helped Gail with hers, we were more than a bit hot and sticky. We had just enough time to clean up and head off to dinner where camp really begins. events amazing mostly for the fact that after you have been there a few years, it always seems as though you just pick up where you left off last year with people, whether you had any contact with them during the year or not. It's like coming home. The books is Spin It which has a lot of great info. 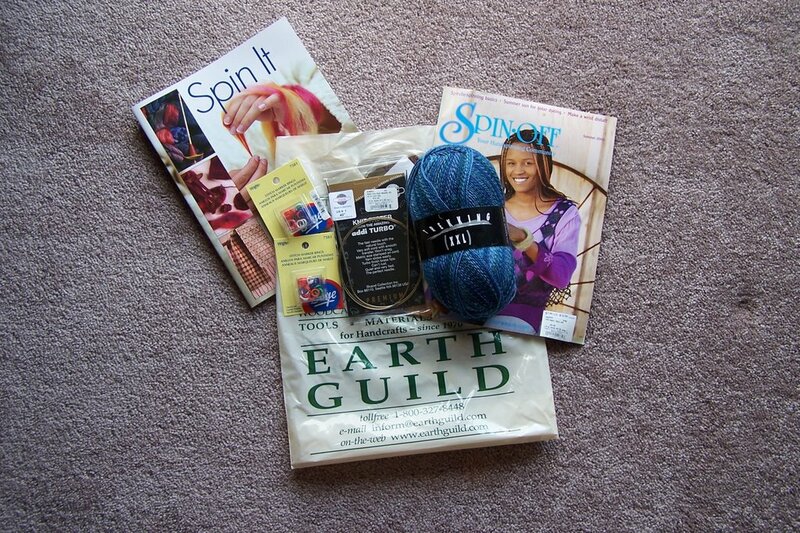 about hand spinning, an old issue of Spin Off magazine, another size 1 addi turbo for socks, some trekking in a great blue colorway, and some split ring stitch markers that I thought might be good for socks. 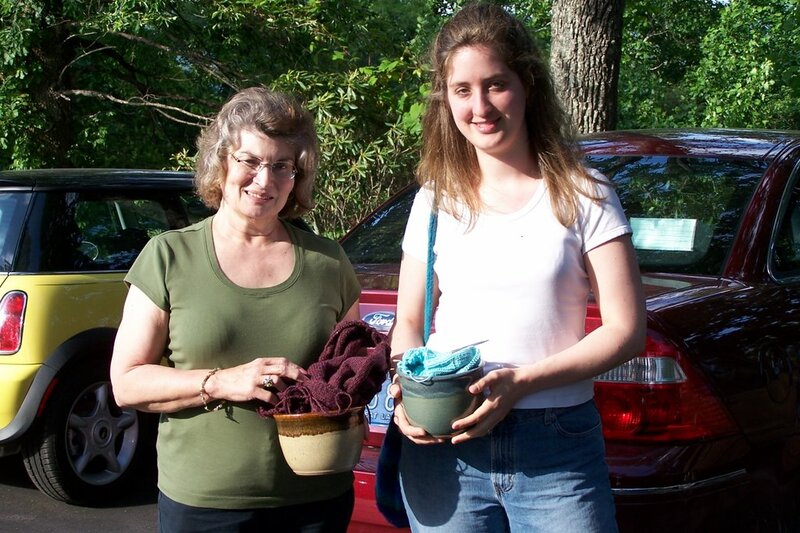 There were several other knitters at camp this year and I spent a lot of time with one named Jerri. She is the spouse of one of the campers that comes back year after year. As we knit and chatted I noticed that she had the most interesting knitting accessory that I had seen in a while. 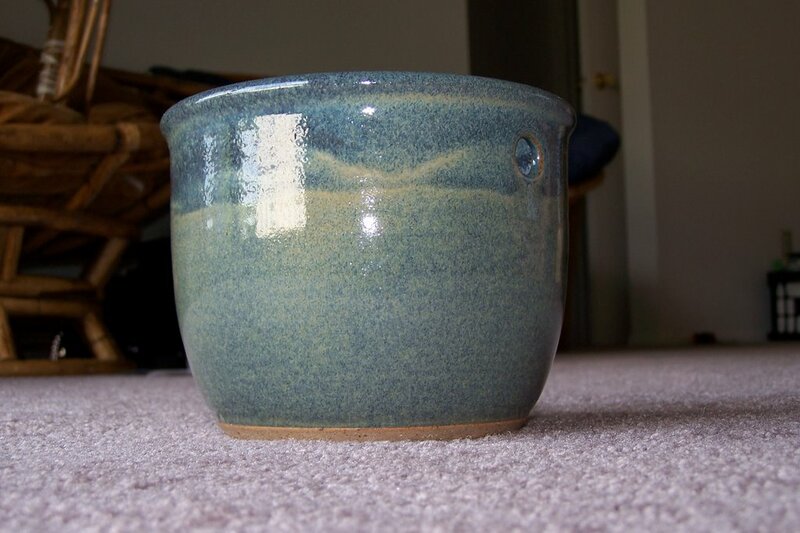 It was a hand thrown bowl with a little hole in the side, the purpose of which was to put your yarn in the bottom, run it through the hole and have your project yarn flop around inside the bowl instead of falling all over the place (or having your kitty chase after it in my case). 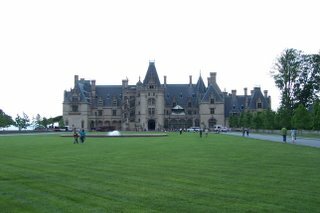 Obviously I had to know more and it turns out that the caretaker of Wildacres, whose daughter is a professional potter made it! So a day or two later Jerri and I went to her studio to check out the knitting bowls and a variety of her other pieces. Needless to say, Sarah is also a knitter and happened to know about a very cool yarn store in the neighboring town of Burnsville. So the three of us went off to go yarn shopping after Jerri and I made our purchases at Sarah's studio. Yummi Yarns is actually located in the back of an art Gallery where local artisans display and sell their works. You'd never know there was a yarn store in there if you didn't already know about it. The rest of camp I alternated between participating in the usual camp activities and just taking time to sit out on the porch and enjoy the glorious weather (we only had that bit of muggy weather the first two days and one day of rain. It was just heavenly) while knitting or crocheting either alone or with others. 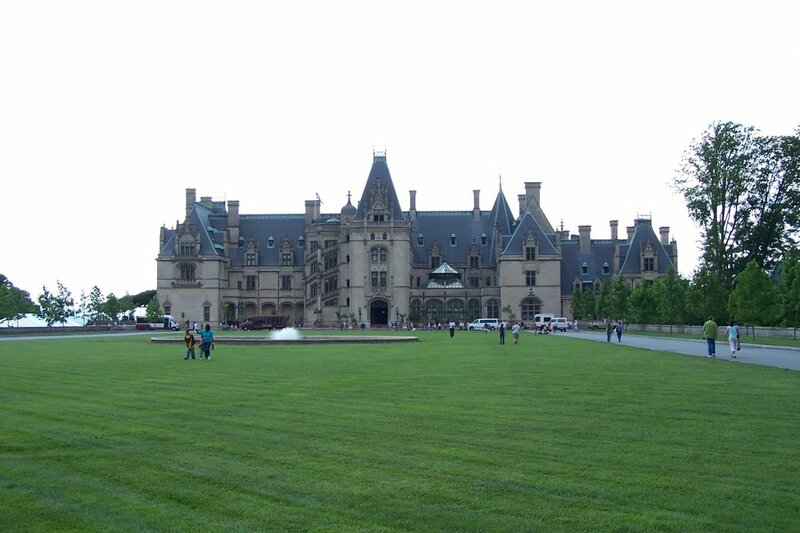 On our day off, HWJF and I took a quick trip to the Biltmore Estate in Asheville. And the winery was fun too! :-) I think this was really my first wine tasting of this type. It was really nice to be able to try things out before deciding what to buy. We ended up with three nice bottles of differing types and a couple of glasses to go with them. And as you can see I also ended up with an Addi Natura (my first) and some sock yarn that HWJF was drawn to although I don't think he wanted to admit it. So tomorrow it is back to work and the five hour commute from CT to NYC. Ugh. My only consolation is that I only have three weeks more of that before I'm finally in NJ for good. Of course that means a lot of serious packing in the meantime, but (as Scarlet O'Hara would say) I'll think about that tomorrow. You can expect a couple FO posts and some project updates throughout the week, but don't be surprised if I'm a bit slow with things. I think the 5am wake up call tomorrow morning is going to hurt in more ways than one. Thanks for reading this far and I hope you all have a great week! While I'm out of the woods and back in NJ for the moment, I'm not organized enough yet to give you a full account of bassoon camp and the last two glorious weeks. So instead you get a finished object post that is long overdue! Not much to say about this project except I'm really happy with how they turned out. I had a difficult time getting started with this yarn, mostly because I just wasn't used to how stretchy it really is. I also tried doing these on clover bamboo circs at first and that was just not going to happen. I couldn't figure out if I was supposed to stretch it as I knit or not. 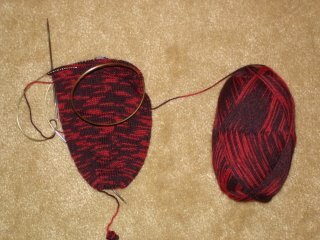 Once I switched to the addis, I realized that I could just knit and let it stretch or not as it pleased. The pattern was really simple to memorize and it made for good commuter knitting. Now that I know how to work with it, I really love the yarn and definitely have a few more pairs planned with it in the future. More to come on bassoon camp and my yarny adventures while on vacation. If you'll excuse me for now, I have over 300 bloglines subs to read! 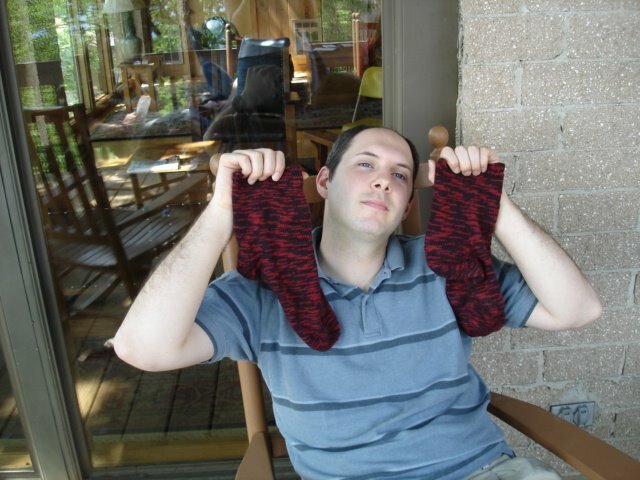 Summer of Socks blog is ready to roll! Here we go! 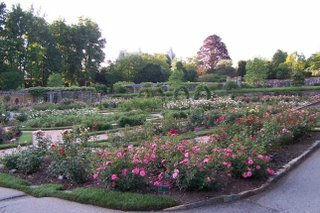 Come check out the new home for the Summer of Socks! I'm outta here until June 12th. There may be a random post here or there, but don't expect much from me until then. I wish anyone in the U.S. a very happy and safe Memorial Day weekend! See you all when I get back from bassoon camp! I'M FREE!!! NO WORK FOR ME FOR TWO WHOLE WEEKS!!! Sorry for the sporadic blogging this week. I really have no idea where the week went! I guess all this build up to the big vacation is finally hitting the fan (if ya know what I mean) and it just seems like I've been so busy with other things that I haven't gotten the time to blog. The first major load of my stuff went to NJ on Thursday morning (woot!) and now the packing for vacation and for sending more stuff to NJ this weekend seems to be consuming all my thoughts. Well, that AND the Summer of Socks, which is up to 75 members (remember: today is the last day to sign up!). Look for an update on that early tomorrow morning. 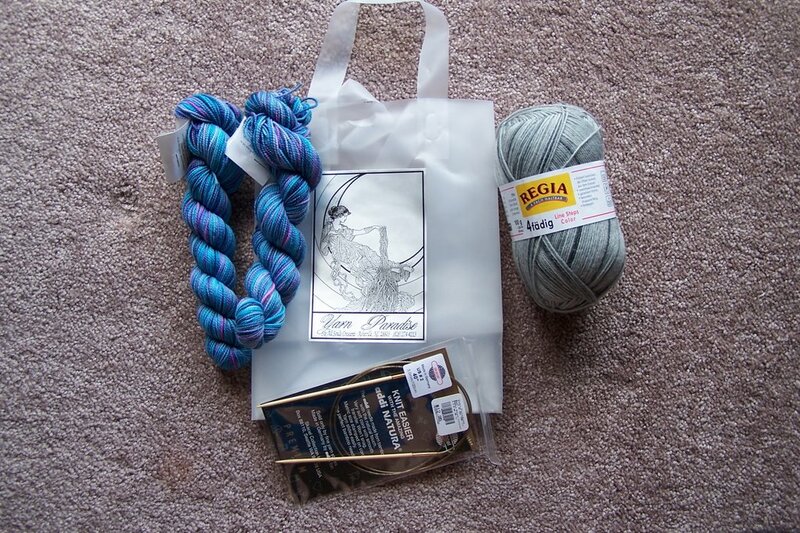 So since this really is a knitting and crocheting blog and all this stuff about alongs and moving and such is not exactly exciting I will attempt to not bore you with a display of what is actually going to go to bassoon camp with me craft-wise. You probably already know that bassoon have to go to bassoon camp right? Very close to being done at this point. I'll be very interested to see how the sleeves actually work out. 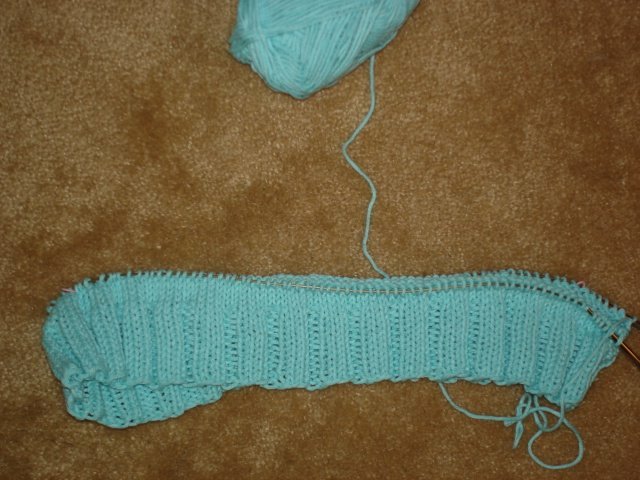 So far I still love the yarn but, I'm sorry to say, the pattern directions are terrible. I got the errata from the Interweave site and that only covers part of the pattern and even THAT is not very clear. I hate to write badly about such a pretty pattern, and I don't know if it is the designer or the magazine editors that are to blame for the overall write up, but the directions are very poorly done. Luckily this pattern includes two very good pictures or I may have given up on this long ago. Bob is my green project for May and Project Spectrum. (Ummm... can you say "Not gonna finish by the end of May". Yeah.) I figured I could probably only take so many pictures of green leaves before I made you all sick, and, well, I haven't taken a single one yet so better to go with this plan. I'm doing this in the sadly discontinued Cotton Ease in Pistachio. I saw a similar one here and thought it might be interesting and might not look awful on me. Green really isn't a color that speaks to me much, and I guess it's apparent since I haven't gotten very far with this. Oh yeah, and my gauge isn't quite right.... so this ought to be interesting. Which is all the other stuff I'm taking with me (here's hoping HWJF doesn't see this picture in the next 24 hours!). 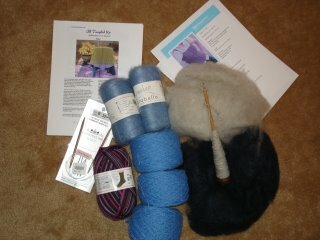 I'm going to attempt some more spinning, perhaps start a kiri shawl, a pair of socks for moi, and a tube toporini. Think that's enough to keep me busy for the next two weeks?